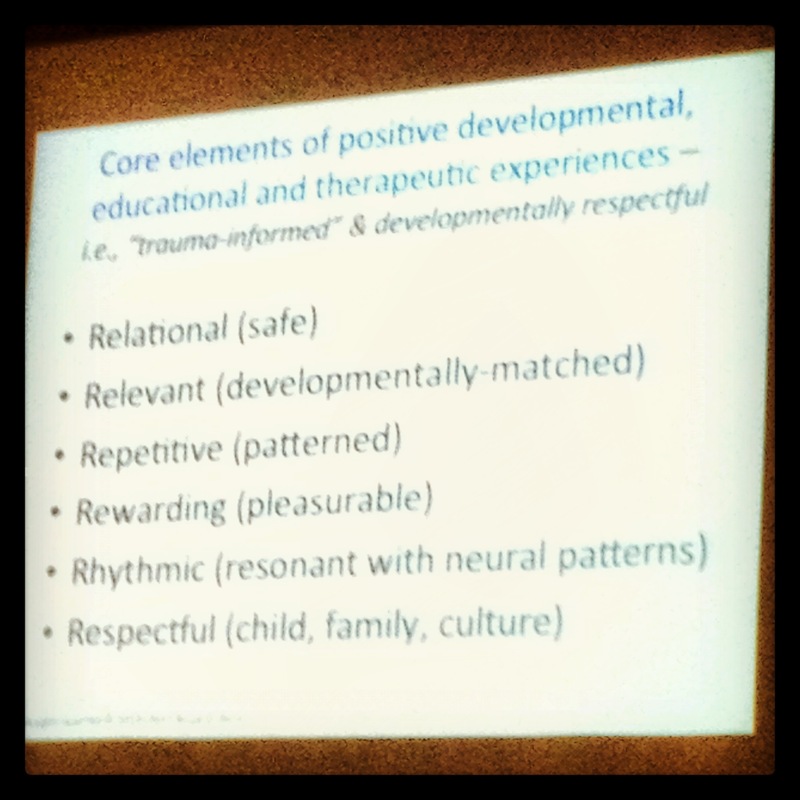 6 R’s: Relational, Relevant, Rhythmic, Repetitive, Rewarding, Respectful: These 6 R’s are what Bruce Perry identified at the beginning of the day as core considerations for trauma informed care when implementing therapeutic interventions and experiences. I try hard to be mindful of these R’s through providing art interventions and experiences that introduce and/or strengthen these areas. Art expression and the creative process is a great companion to so many of these! Side by Side (parallel) vs. Face to Face: In our interpersonal experiences with one another, being present in parallel or working, walking, (and I will add art-making!) together side by side better supports regulation and relational enrichment in comparison to being face to face from one another. Regulate –> Relate –> Reason: Therapeutic experiences should begin with a state of regulation (feeling safe) to then build on creating relational enrichment and understanding. We are relationally contagious: Our environments and the people who surround us influence our own behavior, values, and understanding of the world. Regulation = Safety: When we are regulated, we feel safe. Power of Rhythm: Fostering relational rhythm through movement, music, breathing, and other safe patterned sensory based, neural experiences is the best way to create, instill, and maintain regulation. I believe art-making is also an important sensory based experience where rhythm can be cultivated to soothe heightened states of arousal and trauma reactions. Relational rewards vs. Value rewards: The stimulation of reward to the brain is a strong motivating factor. Relational (relationships and attachments) rewards can struggle with or override value based rewards (individual beliefs, attitudes). 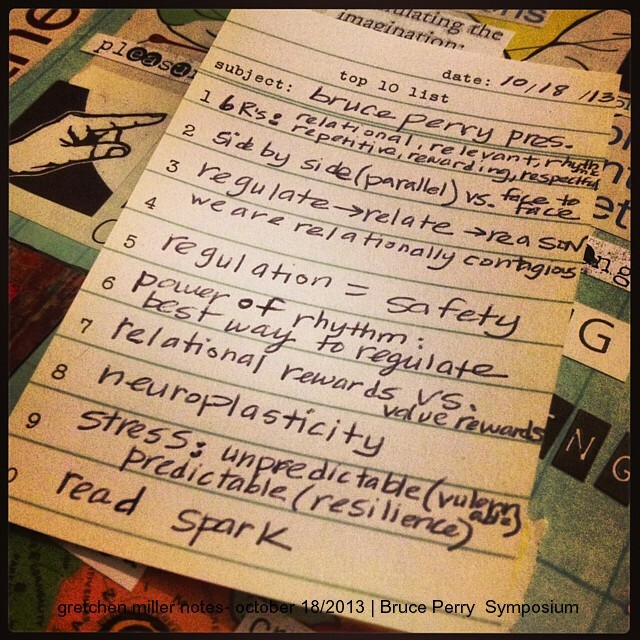 Neuroplasticity: How do we support neuroplasticity to make changes in the brain? (i.e. the brain’s capacity to change and to process information in new ways) Understanding that in trauma intervention, working from the “bottom up” in regards to the brain’s anatomy is key. I am always in awe about Dr. Perry’s work and research related to this topic and his development of the Neurosequential Model of Therapeutics (NMT). Lots more info on neuroplasticity can be found in this Child Trauma Academy publication on Brain Structure and Function here. On Stress and Vulnerabilty vs. Resilience: When stress is unpredictable, severe, and prolonged this fosters vulnerability. When stress is moderate and controlled, this fosters resilience. SPARK: Dr. Perry referenced and recommended checking this book out several times during the day. “SPARK is the first book to explore comprehensively the connection between exercise and the brain”. Super nice way to end the day! It was an honor to hear Dr. Perry speak again and look forward to him visiting Cleveland again soon to keep learning and being inspired by all the work he does! 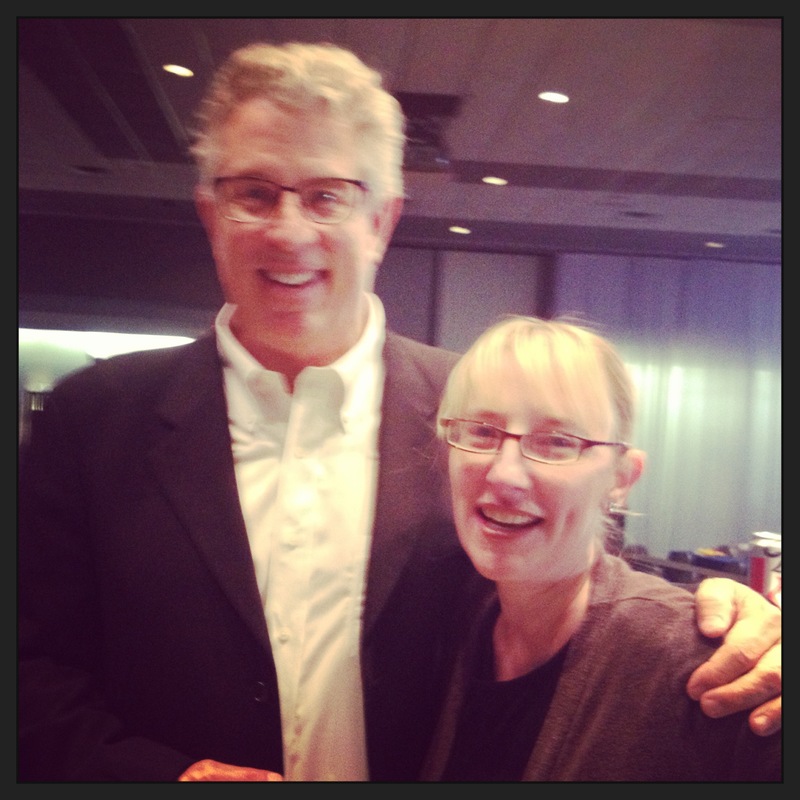 You can learn more about his work, publications, research, courses, and upcoming events via The Child Trauma Academy. April is National Child Abuse Prevention Awareness Month. The start of April is only a few days away and in this post I wanted to provide a head’s up and share some resources, information, and some local professional events in my area recognizing National Child Abuse Prevention Awareness Month. According to the U.S. Department of Health and Human Services Administration for Children and Families website, National Child Abuse Prevention Awareness Month is “a time to recognize that we each can play a part in promoting the social and emotional well-being of children and families in communities“. The site’s Child Welfare Information Gateway includes a free 2012 Resource Guide: Preventing Child Maltreatment and Promoting Well-Being: A Network for Action (as well as other resources, tip sheets, and tool kits) that organizations and providers can use to support their advocacy, prevention, and intervention work with youth, parents, and families around the issues of child abuse and neglect. There are also Treatment & Trauma Informed Care Resources on the Child Welfare Information Gateway about “building trauma-informed systems, assessing and treating trauma, addressing secondary trauma in caseworkers, and trauma training” that are also worth a look. Sites such as Child Trauma Academy, National Child Traumatic Stress Network, and The National Center for Trauma Informed Care are included as additional resources to check out. Lorain County Collaborative on Child Abuse Awareness and Prevention 7th Annual Child Abuse Awareness Conference on April 18th at Lorain County Community College’s Spitzer Conference Center in Elyria, Ohio. This full day conference includes offerings focused on family violence and child abuse prevention, human trafficking, investigations, and childhood trauma. In the morning, I will be providing a 2 hour presentation highlighting the benefits of using art therapy in trauma intervention with children. Early Bird Conference Registration before April 11th is $40. After April 11th: $50. Discounts available for students and agencies who send a group of staff members. Continental breakfast, lunch, and continuing education available. For more information, visit this event page from the Nord Center. 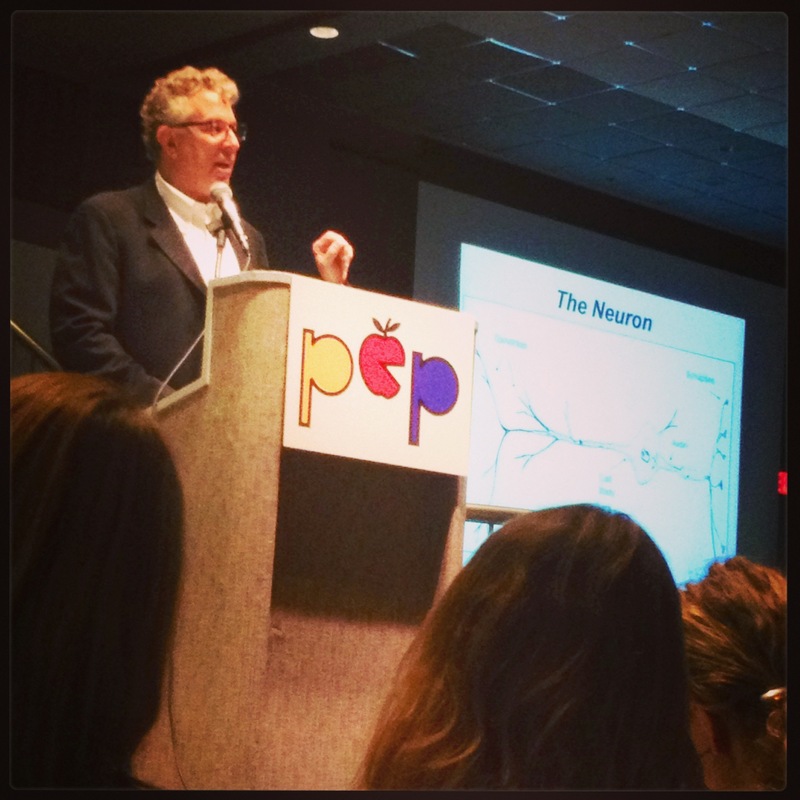 Power of Prevention Conference hosted by Cleveland’s Domestic Violence & Child Advocacy Center, April 24 will feature an all day workshop and luncheon with national authority on childhood trauma, Dr. Bruce Perry at Landerhaven in Pepper Pike, Ohio. Dr. Perry is a Senior Fellow at the Child Trauma Academy and is the author of The Boy Who Was Raised as a Dog and Born For Love: Why Empathy is Essential and Endangered. To attend the luncheon only (1 CEU) is $40.00, the workshop & luncheon together (5 CEUs) is only $60.00 before April 13th and $75.00 after. On-site parking is free and a continental breakfast, as well as lunch are provided. CEUs available. Visit DVCAC’s website to register or to download the conference brochure. Both of these conferences are super affordable, include continuing education, and a great line up of content about children, family, trauma informed considerations and more if you are able to attend!